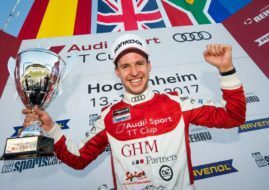 Mikel Azcona completed a perfect weekend at Norisring with the victory in the Race 2 of the Audi Sport TT Cup. The Spanish driver again started from pole position and triumphed after the action-packed event. A total of 17 cars started the second race of the weekend but only nine cars were able to reach the finish line after the crash fest. Tommaso Mosca finished 2nd while the 3rd place was won by the championship leader Philip Ellis. The next round of the Audi Sport TT Cup will be held at Circuit Park Zandvoort, August 19-20.